Czech Nymphs were developed within the Czech Republic in the mid 1980's. Competition Fly Fishing is very popular in Europe and the Czechs achieved many Gold Medals utilizing their Czech Nymphs as well as the Czech nymphing technique used with this fly. The pattern represents Caddis Larvae and Scuds. The pattern was adapted to Sierran fisheries in the late 1990's and is very useful in getting nymphs quickly down into fast moving water, working along the bottom. There are over 100 patterns of Czech nymphs, in a range of colors and sizes. They are generally a heavily weighted fly using lead wraps but sparsely dubbed bodies to create a slender, streamline profile. 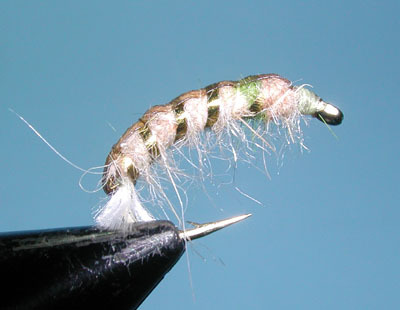 The body is capped by a thin shellback which makes it appear as a case-less caddis larvae and helps to streamline the fly for quick sinking. 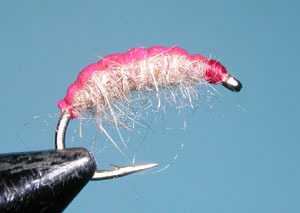 A heavy caddis pupae or shrimp hook is used for added weight and to provide the curvature of many caddis larvae, like the Hydropsyche. 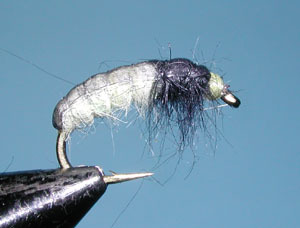 Use at least three different diameters of lead wrap as the nymphing technique calls for different weighted nymphs to be placed within certain locations of the nymph rig. See Nymph Tactics. 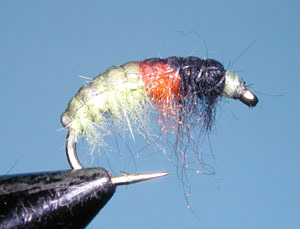 You can differentiate the weighted flies by color-coding the head wraps, ie black-heavy, brown-medium, and cream-light. Try a number of shellback colors or mark the shellback with different colored markers. Check the naturals of the stream and try to match the colors that you encounter. Check the colors of the fly once it's been wet.